When others are selling, smart investors are buying. Here are two stocks to put at the top of your market-crash buy list. If there are two things investors must know about market crashes, it's that they're inevitable and that nobody knows when the next one will happen. 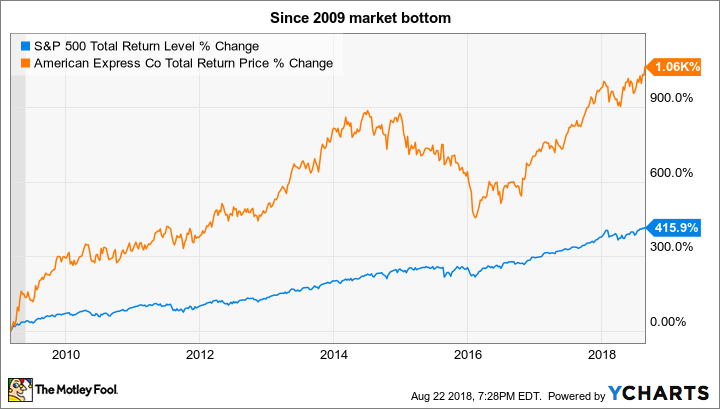 But with the S&P 500 and Dow Jones Industrials having almost returned to the all-time highs reached earlier this year, plenty of investors are once again thinking about the inevitable "top" and what to do to protect their portfolios from the next crash. But instead of getting caught up in the crazy-making task of trying to get out of the market just before the next crash -- which isn't a good idea anyway -- the best strategy is to use market sell-offs as buying opportunities. After all, you may not be able to time the top or bottom of the stock market, but you should be able to recognize a great company on sale. And two that are high on my list of stocks to buy during a market crash already have prominent places in my portfolio: CareTrust REIT Inc. (NASDAQ:CTRE) and American Express Company (NYSE:AXP). Let's take a closer look at why they could be perfect candidates to buy during the next market crash. When the market falls sharply, it rarely happens for no reason. And as we saw during the global financial crisis, there were plenty of banks and other financial institutions that failed, wiping out trillions of dollars of investor wealth. And while plenty of nonfinancial companies struggled early in the Great Recession, there were far more great stocks trading at incredibly cheap prices. You just had to have the intestinal fortitude to buy in the middle of a worldwide recession. And that's where a real estate investment trust -- REIT for short -- like CareTrust comes in; the very nature of its business should make it easier to buy and hold during a market crash. It has already proven a solid investment since paying its first quarterly dividend in late 2014. CareTrust's focus on senior and healthcare properties should be resistant to recession, and its hefty dividend, yielding 4.3% at recent prices, should prove to be a dependable source of income. Ninety percent of CareTrust's future revenues from rents are under contract through 2027 due to long-term lease agreements with the healthcare providers that operate the facilities CareTrust owns. Add it all up, and CareTrust should be at the top of your shopping list when we do eventually see the next market crash. 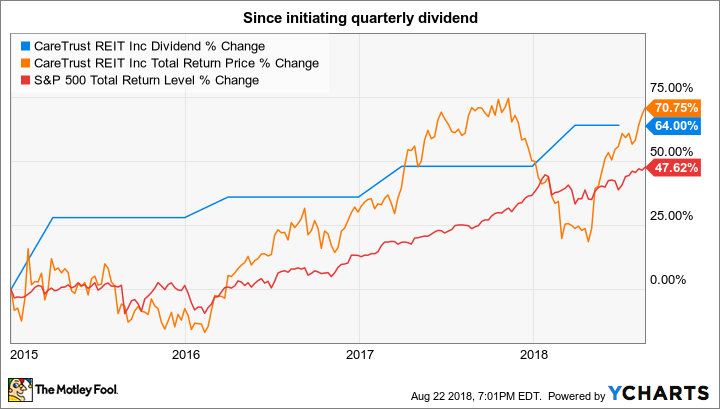 Its stock price may not fall as far as others, and the value of its recession resistance and steady dividend could cause it to rebound quickly, but any opportunity to snap up this top-notch dividend growth stock on the cheap shouldn't be passed up. Market crashes can create incredible opportunities to buy great companies for scrap-heap prices. That was certainly the case for American Express in March 2009. Since then, its share price plus dividends paid has delivered investors a stratospheric total return. No revisionist history here; AmEx wasn't a risk-free investment at the time. There were legitimate concerns about its ability to survive the financial crisis just on its cash flows and balance sheet, since the company behind the famous charge card is also the bank lending its customers the money to make the purchases. AmEx did take some TARP funds to shore up its balance sheet, but was also one of the quickest to repay the money. Furthermore, the company never had to take tough steps like cutting its dividend to keep things together, more evidence that the company knows how to manage credit risk very well. Yet even with that strong history, I expect American Express stock to take a beating once again during the next market crash, because of concerns over its consumer lending and the risk -- whether real or perceived -- that creates. Heck, I wouldn't be surprised to see AmEx stock fall even more than the market during the next crash, if only temporarily. But here's the real kicker: AmEx is already pretty cheap. Management expects it to earn $7.10 per share this year, which works out to about 14.9 times 2018 earnings based on recent prices. That's a solid value for a great company today, particularly considering its growth prospects on global economic expansion, the spread of electronic payments, and the growth of the global middle class. If Mr. Market decides to mark AmEx down even further during a future market crash, you'll find me in the line to buy more.